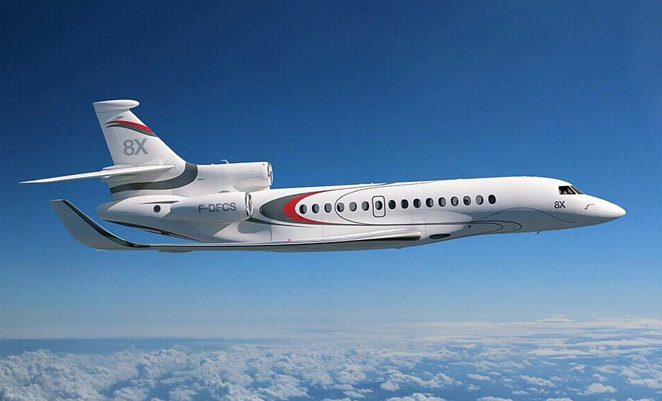 Dassault Aviation has used the 2014 European Business Aviation Convention & Exhibition (EBACE) in Geneva to launch its Falcon 8X, the largest and longest ranging of its Falcon family of business jets. The Falcon 8X, a mildly stretched development of the 7X, will feature a range of 6,450nm (11,945km) at Mach 0.8, meaning in a typical eight passenger and three crew configuration, the aircraft can operate on city pairs such as Beijing-Los Angeles, Hong Kong-London, London-Cape Town, Mumbai-Sydney, and Moscow-Los Angeles. Its 13m long cabin – the 8X will be stretched by 1.1m over the 7X – is available in up to 30 different configurations. The Falcon 8X will be powered by the P&WC PW307D engine, a five per cent more powerful version of the Falcon 7X’s PW307A. The aircraft also promises very good field performance due to its high angle approach and low approach speed capabilities, allowing it to operate into airports such as London City and Aspen. Construction of the first Falcon 8X development aircraft is already underway, with first flight expected in early 2015. Certification and first deliveries are due to start by the end of 2016.